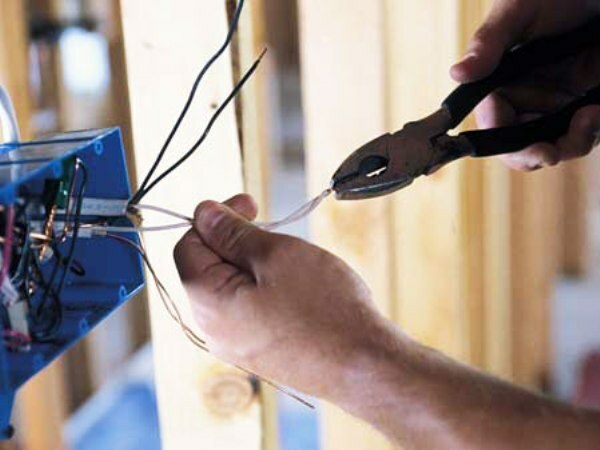 The wiring in the house may seem a simple procedure but in fact it requires deliberate actions and pre-planning. Otherwise, when using an electrical appliance you will experience the inconvenience and in the worst case will require a full reconstruction of power supply system. In order to properly dissolve the wiring, you need to consider a number of requirements for the power supply system. First, consider how many outlets and switches will need to install in the house and determine where they should be. Scroll to the place under the box, which will house the meter and machines for regulating the power supply. Space in selected places, elements of the system and make the walls of the recesses for installation of sockets, switches and distribution box, using the drill. In accordance with the planned number of electrical appliances purchase the necessary outlets, switches and connecting wires. For line input, get a cable with a diameter of 4.5 mm. Room will require wiring of the cable cross-section 2.5 mm for sockets, switches and lighting will be enough wire size 1.5 mm. When choosing the placement of switches and sockets to be guided by considerations of convenience. Standard sockets should be installed at a distance of 200 mm from the floor. Switches conveniently placed at a height of 900 mm, it was convenient to use them, not raising my hand. In each room install splice boxes. The best would be to place them over the outlets. In the presence of the ceiling drywall of the box install on the ceiling, attaching them with screws. In other cases, hide the box in the wall. From the junction box, route the connecting wires to circuit breakers, outlets and lighting. For cabling in the walls do the "grinder" grooves (grooves). After the cable going into the wall seal the plaster and zarovnaya. It is desirable to draw on paper the layout of the cable so that, if necessary, repair or dismantling it was easy to access communications without wasting time in search of them. Set in box electric meter and circuit breakers. You will need separate machines on the kitchen group for a washing machine, air conditioner, heater (if available). It is recommended to provide a separate machine for each room. On each machine, select the markup, which allows to determine its purpose. Now connect all wires from junction boxes. Install switches, outlets and lighting. Connect the power supply, check the system for operability. If necessary, correct any errors in the installation.